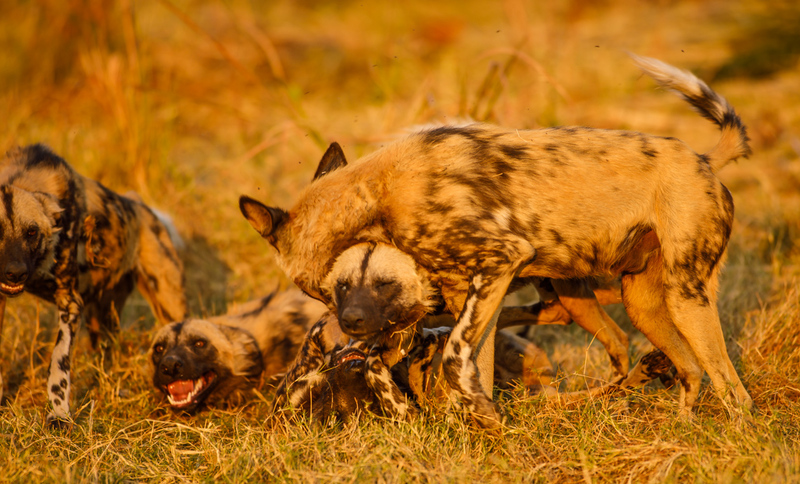 After many years of the absence of good numbers of wild dogs in the Mombo area, they have certainly made a comeback and seem to be settled. There are many things special about Mombo Camp and area, but what never ceases to amaze me is the variety and abundance of different species. 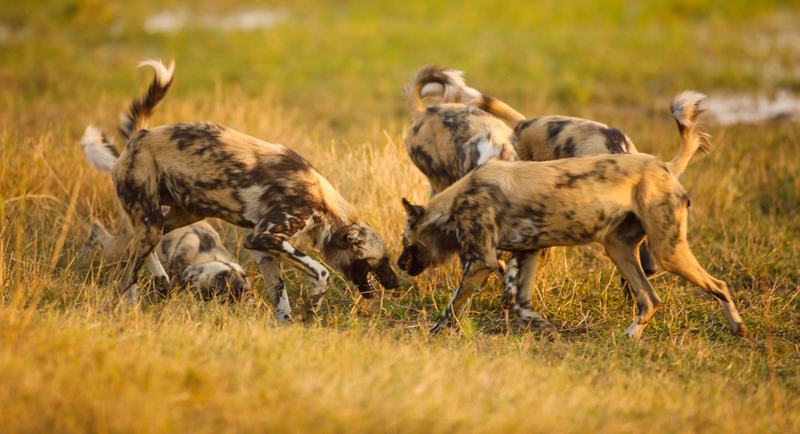 On arrival at Mombo we heard of a pack of wild dogs that had been found that morning, not far from camp. Knowing that as the sun began to set, they would get active and start their hunt, we decided to look for them and wait for the ‘ceremony’ that signals the start of each hunt. Typically what happens is that one of the older dogs wakes up, stretches and then stalks towards one of its mates, with its ears flat and tail tucked down. This signals a sudden burst of energy amongst the pack and they all explode into life, running around in circles, greeting each other as if they haven’t seen one another for years. High pitched calls and much chasing takes place until the initial excitement subsides and they start their steady trot in formation across the plains, scouting for antelope. 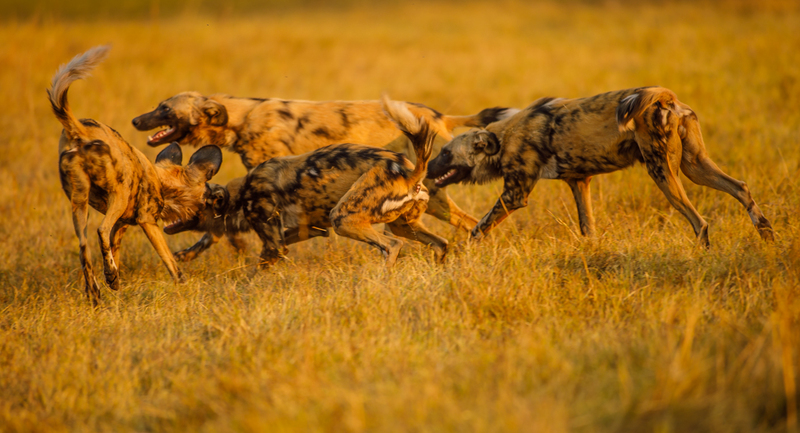 It’s quite a sight to see a large pack such as this one, trotting with purpose towards antelope off in the distance… the result is usually a high speed, chaotic chase, ending with a kill that is finished in minutes.  The stronger healthier dogs stand back and allow the older and weaker members to feed first and if there is nothing left, they will hunt again. 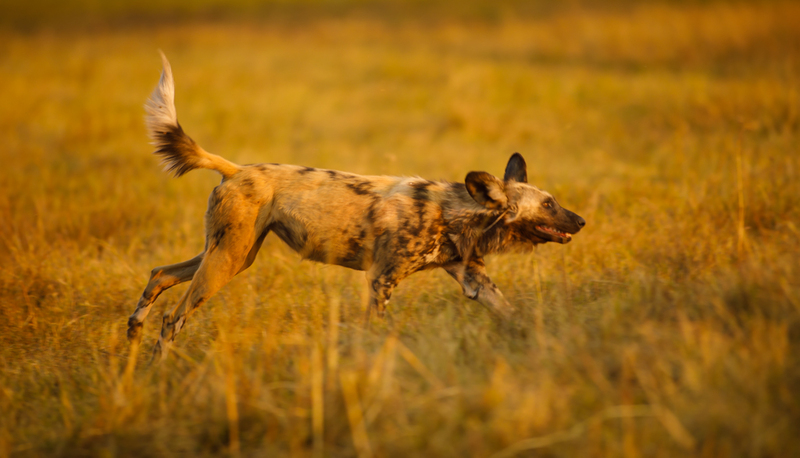 Although we followed the pack as best we could when they chased kudu and impala, we couldn’t keep up with them as they blasted off at full speed through the islands and thickets at last light. We know that somewhere they had killed something, but for us it was enough to have been able to follow these animals literally in the dust of their hunt and spend time with one of the most endangered carnivores in the world.